This recipe was an instant hit with the family, especially my toddler and my husband. You know it is good when your toddler is stuffing her mouth with a piece and immediately asking for the next piece, and your husband asks you to give him the recipe! The best part is, these vegan, egg-free, dairy-free, nut-free sweet potato fries are good for you and super fast to put together. Make double the portion, to save some to enjoy for later. Just reheat in a toaster oven for about 5 minutes before serving. This makes a great appetizer or tasty side dish to go with any meal. Or if you prefer, enjoy these fries all on their own as a nutritious snack. You could also make a double portion and bring these along for all to enjoy at a picnic or celebration gathering! These vegan, egg-free, dairy-free, nut-free sweet potato fries are fast to make and enjoy alongside your main course. Preheat the oven to 400 F (or 204 C). Wash, peel and slice the potato into strips. Toss the sliced sweet potato strips in a large container (with a lid) with the corn starch. Once all coated, add in the oil, close the container and shake again to coat the strips well. 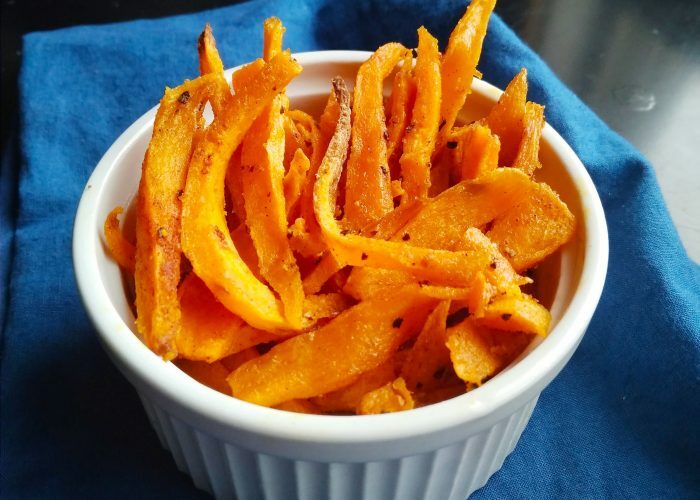 Sprinkle on the salt and ground black pepper onto the sweet potato strips in the container and then close the container and shake again to coat the strips. Alternatively, use your hand to rub or massage in these seasonings to make sure all are evenly coated. Finally, sprinkle on the paprika and garlic powder on the fries and again shake the closed container to coat the fries. Arrange the sweet potato strips into a single layer on a baking tray or glass casserole bakeware. Bake 10 -12 minutes each side, or until crispy. Remove from the oven and enjoy! These sweet potato fries get crispy much faster if the fries are placed in a single layer on the baking tray or in the glass bake ware. Keep watch towards the end (after you have flipped the fries once) when baking to make sure the fries don’t get burnt. If you prefer, you can arrange the sweet potato strips on the baking tray or glass casserole bake ware first, before sprinkling on the paprika and garlic powder evenly over the potato strips prior to baking.